Tdap and pregnancy | Live Healthy S.C.
August is National Immunization Awareness Month, and this week concentrates on “A Healthy Start” for moms and babies. 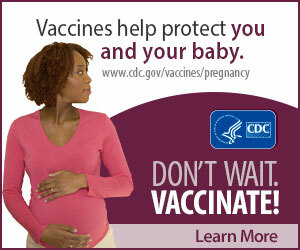 One way to give your child a “Healthy Start” is for expecting mothers to get a Tdap (Tetanus, Diphtheria and Pertussis) booster shot, which protects mom and baby from pertussis known as “Whooping cough.” The CDC recommends mothers get their Tdap vaccination in the third trimester between 27 and 36 weeks of each pregnancy. Pertussis is extremely dangerous for infants, yet is entirely preventable. Mom can also get some help in protecting her child from pertussis by “Cocooning” and ensuring each parent, grandparents, siblings, or anyone else around the baby is also up to date on their Tdap vaccine. This entry was posted in Community Health, Disease Control, Maternal & Child Health, Prevention and tagged children, pregnancy, prevention, Tdap, whooping cough, women on August 7, 2014 by SC DHEC.